This is a sponsored post on behalf of Groupon Coupons. All opinions here are my own. I’ll go to great lengths to save myself some money. However, I have come up short any time I’ve tried to master the art of using coupons. Nor am I very good about looking through the store circulars for deals. So, I’ll take any help I can get when it comes to making sure I’m getting the best deal. Groupon Coupons is one of those sites that makes saving money online easier. Research reviews of product to determine brand/model I want. Search for sites that sell it. Go to each store’s website and compare prices. Apply codes to cart and see if they work. This process usually ends up with me having about 12 or so tabs open on my browser at any one given time. There’s got to be an easier way, right? I’ve found some apps that will search for discount codes for you, but it would be nice not to even need them in the first place. Our family has used Groupon over the years to enjoy a number of experiences. You can get some great local deals using Groupon. But did you know that they have discounts for national brands and retailers, too? You can find those in the section called Groupon Coupons. Clicking on one of these stores brings you to a page that looks very similar to some of the other coupon sites I end up on while frantically searching for codes. But one of the big differences is that Groupon Coupons doesn’t have a lot of bogus codes listed. 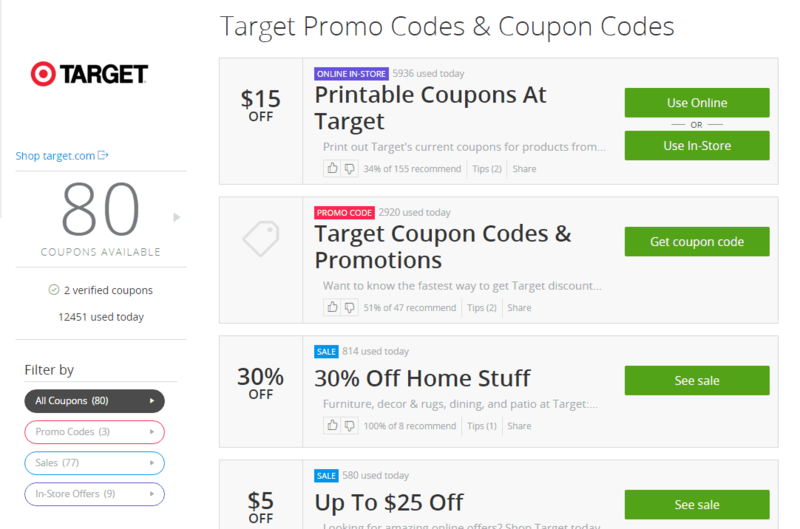 For example, take a look at the Target Coupon page. The site lists 80 coupons available, but if you look closer, only 3 of those are “Promo Codes”. The other 77 are just sales. At first, I felt conned. I didn’t think it was right that Groupon was calling these deals “coupons” when they were just ordinary sales that anyone would get by going to the store or website. Out of curiosity, I opened a few of those other coupon code sites to compare. I was instantly reminded of how frustrating it is to try to find coupon codes that actually work. Most of the codes on those other sites don’t work, and many aren’t really coupon codes at all. In my opinion, Groupon Coupons is one of the more straightforward sites that compiles deals. I’d rather have fewer quality promo codes, as opposed to being overwhelmed with too many and trying them all to find out they don’t work. It also dawned on me that one of the reasons I wasn’t getting excited about Groupon Coupons is because I was in the mindset of looking for coupon codes. It occurred to me that if I shifted my strategy a bit, I could take advantage of the wealth of information on deals that Groupon Coupons has to offer if I look there first. So, instead of banking on finding a coupon code, I can check Groupon Coupons and go right to a brand page that I think might have a deal for me. If I’m not sure what brand/store I want to check, I can search by category and see what comes up. I found the category search to be a little hit and miss. Choosing “Event Tickets” showed me retailers like Kohl’s and Macy’s in the results. That’s not what I expected. “Toys and Games” produced more appropriate results with lots of Toys R Us deals and toy deals at department stores. But “craft supplies” didn’t include Michael’s at all, even though there is a page for the craft store. The Groupon App includes Groupon Coupons. So, if you like to shop using your phone or tablet, they’ve got you covered. On my phone, the app even has a section for “nearby stores” based on my location. So if I’m actually out of the house while shopping, I can use the app to see what deals the store has going on. If you know what you’re looking for and have an idea of where to find it, but you’re not sure if any of those stores are having sales… make Groupon Coupons your first stop. You can check out each stores sales AND see if there are coupon codes before venturing over to the site. That will save you from the frustration of trying to find that last-minute code before you check out. Does your online shopping experience resemble mine? 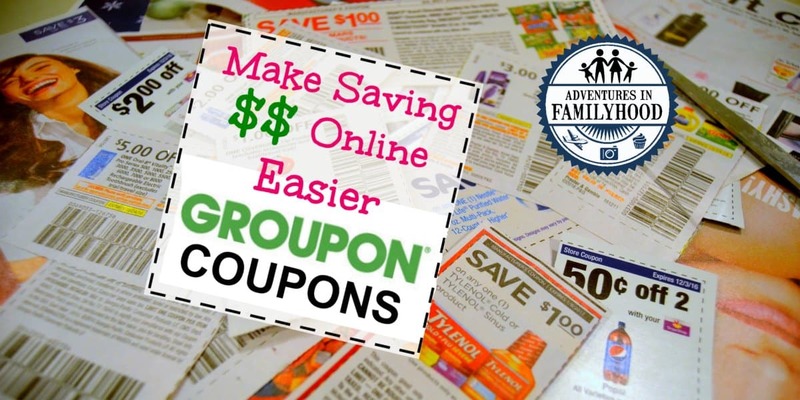 Do you think Groupon Coupons might help you save some money?